Microalgae could become a new cheaper and better source for biofuel thanks to a new way to grow it faster through heat and cold using a new solution. The new method was developed by scientists at Syracuse University. By creating a new medium to culture and harvest microalgae - Tris-Acetate-Phosphate-Pluronic (TAPP) - scientists were able to transition the solution to a gel by raising the temperature by seven degrees to make the microalgae grow in clusters that are 10 times larger than those grown in a traditional medium where they grow in single cells. The temperature was then decreased, and the medium returned to a solution. The algae was then separated through gravity from the TAPP solution, and then harvested. 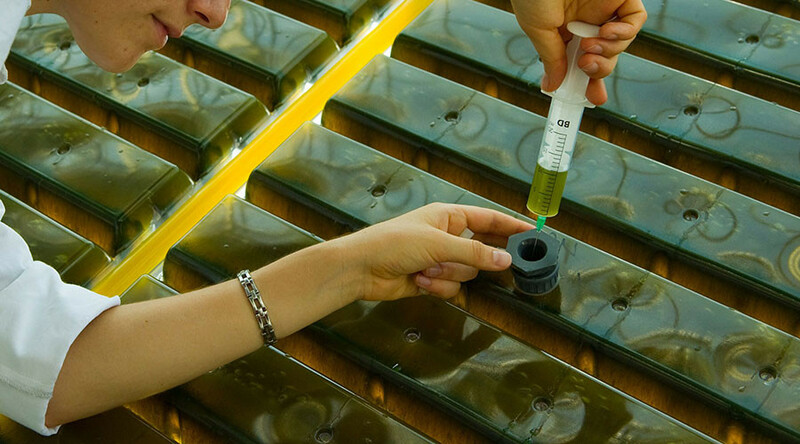 Scientists were trying to solve three problems in microalgae farming. In nature, algae grows from having access to plenty of light and agitation from being on the surface of a moving water body. Lying on top of the water makes it easier to harvest. “When you grow algae in suspension, they tend to stick to the walls of a container, making the container opaque. This makes it more difficult for required light to get through to the algae,” said Professor Radhakrishna Sureshkumar, chair of the Department of Biomedical and Chemical Engineering in a Syracuse University statement. The second issue is there has to be a constant stirring of the container to ensure that light does reach all layers of the algae. The third issue is the difficulty of separating algae from the broth, which requires time and energy, and is therefore costly. The new medium prevents the algae from growing on the sides of a container and lets light penetrate each level of algae. This also eliminates the need for constant stirring. Estime's research has been published as a peer-reviewed article in Scientific Reports.